Posted on 30/04/2007 by Ian Grove-Stephensen Comments5 Comments on Sony PSPs better in the classroom than laptops? Sony PSPs better in the classroom than laptops? In January I speculated that Apple’s iPhone would soon be seen in classrooms. That post drew such a strong response that I was prompted to go looking for better alternatives that are available now. I think I’ve found one in the Sony PSP, and I am sufficiently convinced that I have approached Sony (via their educational distributor ConnectED) to make them available to Chalkface customers. Much, much cheaper. You can put online, multimedia education into the hands of at least five children for every one with a laptop. Wi-fi enabled out of the box. No expensive re-cabling of the school. Parental-purchase friendly. Not just because of the low price, either. Students see PSPs as technology designed for them, and will actively campaign for them on your behalf. More portable. Whether you are shunting them round the school, or students are taking them home to do homework on, the logistics suddenly get a lot easier. Great for multimedia especially as the education bundle comes with still/video camera as standard. Small and discreet enough not to interfere with classroom practice. No built-in keyboard. 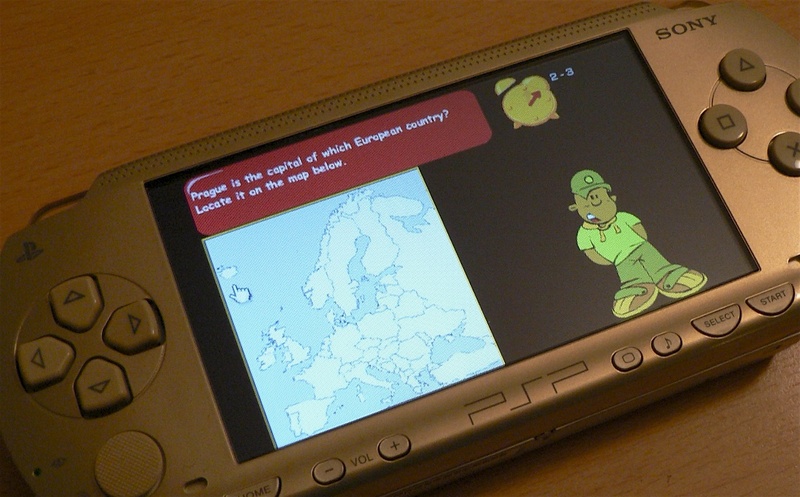 The on-screen text entry is rubbish, frankly (Tengo could be very nicely adapted to PSP, and should be), but the PSP will work with an external keyboard. Small screen. It’s 480×272 pixels, compared to 800×600 for a typical laptop. Browsing complex websites involves a fair bit of scrolling; simpler websites like Yacapaca are fine. No Microsoft applications. If what you are teaching is spreadsheets, a PSP won’t be much good. Obviously this is an analysis coloured by my view that educational content should be delivered via the web, and that delivery should not get in the way of teachers continuing to teach. The PSP won’t dominate your classroom the way laptops would, but at the same time you only have to look at the way students drive their social lives through TXT and MMS on their phones, to realise the power of small devices matched to nimble fingers. Handheld Learning: Very well-informed discussion on this specialist message board. Changing the Game: Bucks LEA advisor Ian Usher’s blog. This was the post that first turned me on to the potential of the PSP – thanks Ian! HECC: Wiki page of PSP-related resources, including some very good stuff on RSS feeds. We are going to have a very small number of demo units available on sale or return soon; let me know if you would like to get on the list for one. Priority will go to regular blog readers and existing Chalkface customers. Product details here. This entry was posted in PSP, Technology, Yacapaca. Bookmark the permalink. I firmly believe that any technology that enables students to learn using “their” technology can only be a positive thing. I am still digesting how exactly these could be used in my context, but this is certainly a great step forward. Great job, Ian!! I am an E2E tutor and am intrigued how we could incorporate this technology into our context. We teach Literacy/Numeracy, Vocational Skills and Personal and Social Development. What software could the PSP interface with? We currently use Broadband, all the Office suite and a range of educational games. Forget microsoft. Go to Googles FREE spreadsheet and WP application. It won’t be long until simple office software is available free and on-line. At the very leats students will be able to word process and take their work back to a PC via their google account. If you’ve approached Sony…..why not approach Google! Can things get any more prestigious?! I am intrigued by this, but has anyone considered the current adverse research into WiFi in schools? This could be a wonderful way to learn, but may be a non-starter as schools bow to the inevitable parental pressure. The latest bad press about wireless technology in schools seems to have sparked further debate?